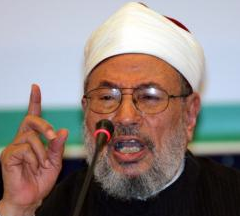 01 July 2013 As the political crisis in Egypt escalates, dividing Egyptians into supporters to President Dr. Mohamed Morsi and protesters, Dr. Yusuf Al-Qaradwi addressed the Egyptian people in a televised speech broadcasted by Al-Jazeera Channel on Sunday, June 30, 2013. Dr. Al-Qaradawi called Egyptians to adopt dialogue to reach a solution for the current deadlock and to steer clear of all causes of disagreement. ‘It is saddening me that I cannot find you (the Egyptian people, united) in one camp so that I can address all of you. ‘What is wrong with the Egyptians? What made them so divided? Instead of cherishing love and selfless, brotherly feelings towards each other, enmity and hatred prevailed. Have not we participated in the (January 25th) revolution (together)? Have not all of us been victims to tyrannical, oppressive regime that stole our wealth, violated our rights, and threw people in jails?